It’s time to kick off the season of superhero movies! You guys, I don’t know how it’s summer already, but here we are. Like yeah, there are tons of things to look forward to about summer (vacation and beach trips and less school, ahem), but I’m most excited about all of the great movies coming to theaters over the next couple of months! 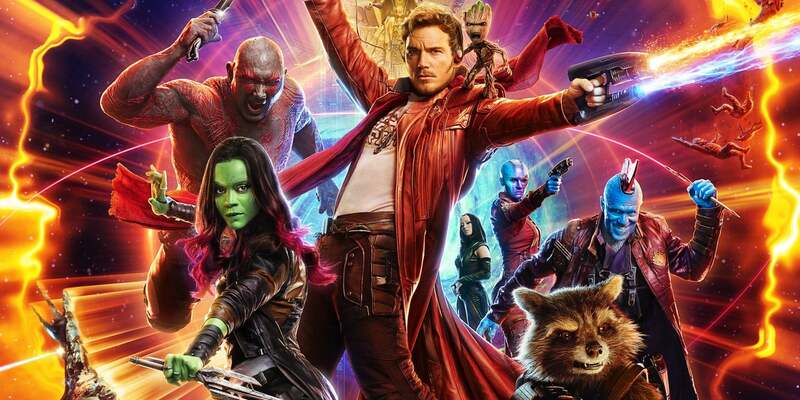 Kicking off a summer that’s chock-full of superheroes is Guardians of the Galaxy 2, which has an early premiere in most movie theaters TODAY!! I know I will definitely be there. One of the best parts about going to a movie premiere (in my opinion) is dressing up to express your fandom. If you’re not sure just how to do that for this movie, no worries! 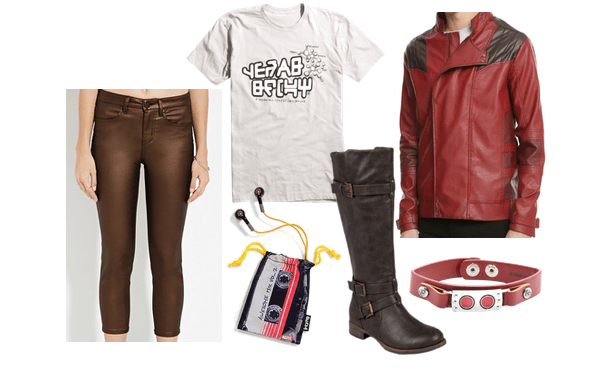 Read on for a few ideas for what to wear to Guardians of the Galaxy 2. Okay, if you like the movie and want to show that you’re here for it but don’t want to get TOO crazy with the wardrobe, here are some of the cutest pieces I’ve found online. You can wear one or a combination of these and still only look like your basic, normal-level fan. Yay! I love that this movie is playing up the ’80s mixtape theme, so here are some fun GotG2 shirts that have a cool old-school rock-band feel to them. And aren’t these keychains just to die for (especially Groot)? 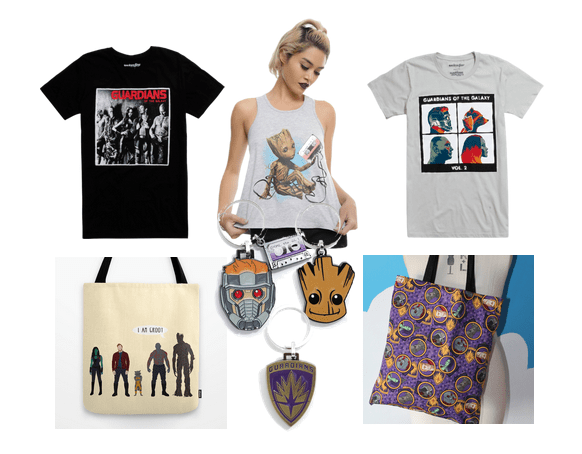 Finally, I love these adorable Guardians of the Galaxy tote bags, which are the perfect size for your phone, wallet, and all the food you need to sneak into the theater. If you’re like me and you love costumes and think the best part about a new movie release is wearing a costume, GO FOR IT. Hot Topic, bless them, is always so good about selling reproductions of movie character outfits, and this year has been no different. Sure, Peter Quill is a guy, but his look is badass and I want to wear it. If you agree, go ahead and pick up a replica of his t-shirt, bracelet, and jacket from Hot Topic, then slip on some cool brown skinny jeans and knee-high boots and listen to your favorite ’80s music with some movie-inspired earbuds. This final look is inspired by Loungefly’s Groot collection, which includes this bag and wallet. One of my favorite parts of the original movie is when Groot protects his friends with a shelter made of vines — It’s such a magical moment. I feel like this butterfly purse accurately captures Groot’s kindness and gentleness. 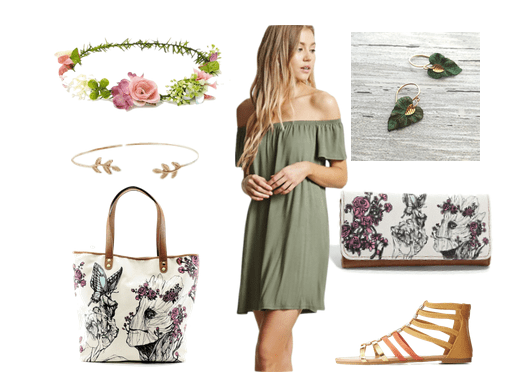 Pair one or both of the pieces from Loungefly’s collection with a fluttery green dress, earth-toned sandals, and leaf-inspired jewelry, then top the look with a whimsical flower crown that matches the palette of the bag. Are you excited to watch Guardians of the Galaxy 2? Will you be dressing up for the premiere? Let me know in the comments! Previous Ask CF: How Do I Make Flared and Bootcut Jeans Look Fashion-Forward?